ALPHA® Fluitin 1535 is an activated rosin cored solder wire developed for general hand soldering applications. The unique activator system offers good thermal stability at pre-soldering temperatures ensuring that Fluitin 1535 performs extremely well on parts and surfaces which present poor or difficult soldering conditions. Fluitin 1535 leaves post-soldering residues that are hard and which can be safely left without the need to remove them. If the removal of residues is required then semi-aqueous or aqueous systems can be used effectively. Minimal, non-corrosive, clear and safe residues. Fluitin 1532 leaves post-soldering residues that are hard and which can be safely left without the need to remove them. If the removal of residues is required then semi-aqueous or aqueous systems can be used effectively. 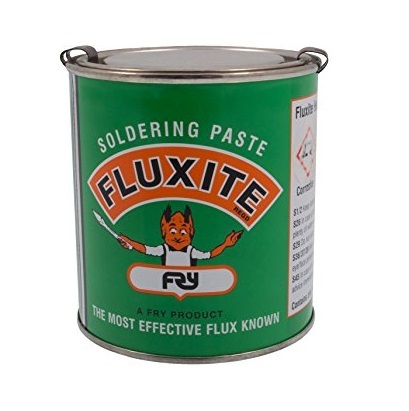 Fluitin 1532 is suitable for use in any commercial no-clean hand soldering application that specifies compliance to J-STD-004 This solder wire has a shelf life of 3 years from date of manufacture. 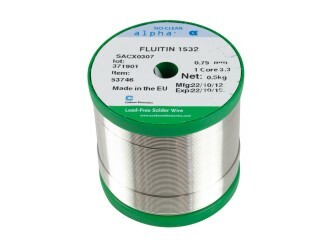 Alpha Fluitin 1532 is an activated rosin cored solder wire developed for general hand soldering applications. The unique activator system offers good thermal stability at pre-soldering temperatures ensuring that Fluitin 1532 performs extremely well on parts and surfaces which present poor or difficult soldering conditions. • ISO 12224 - 1.1.2.